Why do I have affiliate links on cucicucicoo.com? I love blogging and writing about things that I love, however in order to continue doing it, I have turned down work opportunities outside the home, in addition to regularly paying various fees for the maintenance of a website and spending a considerable amount of time creating free tutorials in two languages. In order to make this blog possible, I sell my products, offer advertising space to sponsors and publicize specific vendors and/or products. When I write on this blog, it’s as if I were talking to a friend. (Just ask any of my real-life friends; they often tell me that reading my posts is like having a conversation with me!) Just as I would never suggest a product that I don’t believe in to a friend, I would never do so on my blog either. Each and every time I mention a product and/or vendor, it is (unless otherwise specified) because I myself love it and think that you would too. Most of the time, I don’t earn anything from them, but at times the links to these things are affiliate links. What does that mean? Basically, if a reader clicks that link and ends up purchasing something from that website, I earn a small percentage. It’s not much, but it helps make it possible for me to continue creating useful quality content that any and everyone can access for free. The following is a list of the companies who I have chosen to affiliate myself with. Let me tell you a little about why I love them so much. Amazon.com : I love amazon and have ordered from them for many years in various countries. They supply pretty much anything you could want at great prices, ship quickly and often for free (if you purchase at least $35 of eligible products. What I do is save up products I need and order only when I’ve reached that amount.). Their customer service is beyond compare. I also own a Kindle Paperwhite and download loads of inexpensive or free e-books (I am currently catching up on all the classic literature from the 1800s that I’d never read, all downloaded for free). I also use my Kindle to read generic e-books in PDF form. As I live in Italy, I also have had an account on Amazon.it pretty much since the day the website opened. Craftsy: How awesome is Craftsy?! A point of reference for all DIY enthusiasts, it has an incredible number and variety of online classes and patterns (many of which are free!) running the gamut of crafts. I’m naturally drawn to the sewing patterns and courses, but there are also resources for knitting and crochet, jewelry making, cake design… you name it and they’ve got it! Craftsy makes it easy to learn something new no matter how old or where you live… yah! Sticker Kid: These customized name labels really shocked me with their quality and durability! The stickers are fantastic on kids’ objects so that they don’t lose them at school, day care, summer camp, etc, but companies could also use them to label and keep track of their property (such as in a gym or pool. Did I mention that they’re waterproof?). The no-sew iron-on labels are also a wonderful quality, great for keeping track of kids’ clothing items or for labelling your home-sewn creations without having to sew on an itchy tag. I wrote a full review about these personalized labels and there is an exclusive 10% discount for Cucicucicoo readers only using the coupon code “CUCICUCICOO” (as of date, valid until the end of September 2014 in any regional version of the Sticker Kid website). Etsy: I’ve been using Etsy as a consumer and seller since 2009. This is the ultimate online marketplace for unique handmade, hand crafted pieces. I still remember the first time I saw Etsy and how amazed I was at what gorgeous and incredible things people were able to make by hand. Any time I need a gift for someone and am not making it myself or buying it from a local vendor, I turn to Etsy. It’s great for gifts for people who live far away, too. Often, when I want to give a gift to a loved one in the United States (where I’m from) I look for the perfect item in a US-based Etsy shop and just check before purchasing that it is possible to send the item to the recipient, perhaps even with gift wrap and a little note. This way I am supporting small scale artisans without spending extra and polluting for overseas shipping. Etsy is continually becoming more international. I was thrilled when it became possible for Italian users to view and use the website in Italian and to use the Euro currency because it became even more easy to use for them to use the platform. 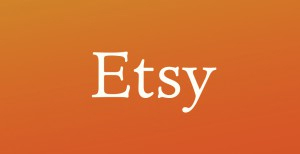 Edit 16/06/14: Etsy now also offers a €5 discount on new users’ first Etsy purchase! All you have to do is click this link!